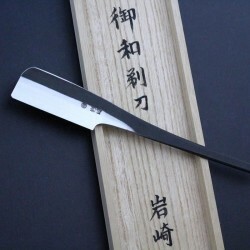 The Japanese straight razor has a long history going back over 1400 years. The razors were first used in ceremonies for shaving the heads of Buddhist monks. In the middle ages they were used to shave the heads of the Samurai. Although Japanese razors are ground on two sides, like Western straight razors, the grind is unequal, ultimately creating one blade. This means that instead of a symmetrical cross-section, one side will have a significant hollow this is called the “Ura” and the other side is called the “Omote”. The Ura is usually signed by the maker whilst the Omote is blank. The steel used to make the razors is traditionally made from iron sand and charcoal which are placed in a specially made oven layer on layer. It is further processed by hand until it is purified and ready for forging. 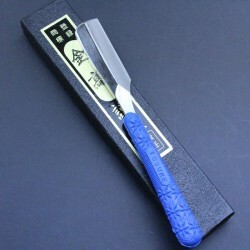 The razor is then made by bonding a small amount of the hard hagane steel to soft iron. 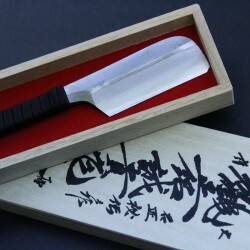 It is the hagane which forms the cutting edge and the thicker jigane is the thicker mild steel which supports the hagane. Depending on the size of the blade they are called Hanchogake, Ichogake or Nichogake. When we can obtain stock, we are pleased to offer the sought after Iwasaki Ichogake size razor, the Ichogake sized Tsurayuki-type razor by master smith Yoshitaka Yamada of Kyoto, under the ‘Kanetaka’ brand name and most recently an chogake Kamisori from Shigeki Tanaka based in Miki.